The risk of nosocomial (also known as hospital-acquired) infections increases significantly when hospitals are undergoing constructions and renovations. Dust particles contaminated with bacteria and fungi are dispersed and pose a health risk for patients, staff and visitors. In order to minimize the risk and prevent hospital-acquired infections, construction projects within and adjacent to hospitals should integrate infection prevention and control into their project management plans. Reported construction-related nosocomial infections are primarily caused by fungi, and to a lesser extent, by bacteria. The most common etiological agent is Aspergillus, in particular, A. fumigatus, A. flavus, A. niger and A. terreus. Aspergillus fumigatus is considered the most pathogenic species and responsible for more than 90% of all Aspergillus infections. It is the most rapidly growing species, extremely tolerant to temperatures, and binds laminin and fibrinogen (glycoproteins) more efficiently than other species, possibly promoting better airway adhesion before invasion. Aspergillus fumigatus spores have a hydrophobic protein-coat layer, which may help the organism to evade the host's defense system. In addition, the very small spore size enables deep penetration into the lung. 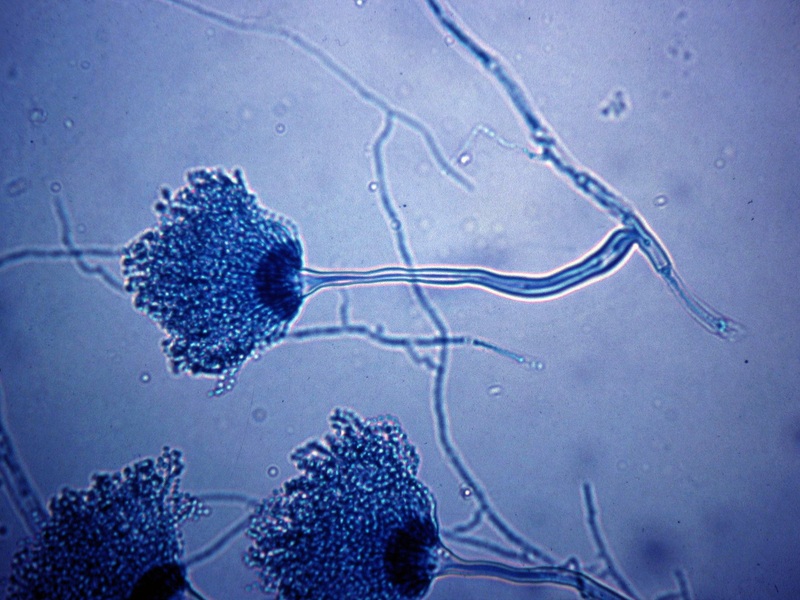 Aspergillus fumigatus. A 4-day culture on Malt Extract Agar. Other fungi that have been reported as causal agents of nosocomial infections include Candida tropicalis, C. parapsilosis, Fusarium, Rhizopus indicus, Mucor and Scedosporium prolificans. Because many of those organisms are found ubiquitously in soil, water and decaying vegetation, fungal spores can easily be dispersed on dust or dirt particles, particularly when floors, walls or ceilings are penetrated during construction. The most common group of bacteria associated with construction-related nosocomial infections are Legionella species including L. pneumophila1. Legionella bacteria have been isolated from soil and dust but are typically associated with aquatic environments. Typical water sources in hospitals supporting colonization with Legionella bacteria are cooling towers, evaporative condensers, heated potable water systems, and heating and air conditioning systems. During construction and renovation processes, water systems are often disrupted. Potable water can become contaminated with Legionella when the water supply is restored. The introduction of contaminated soil into the plumbing system as well as optimized growth conditions for bacteria in stagnant water, may increase the number of Legionella bacteria. The risk of invasive infections by opportunistic pathogens, such as Aspergillus and Legionella, is low for healthy individuals. However, exposure to those organisms can be life-threatening or fatal for patients who are severely immunosuppressed. Planning and measures to avoid construction-related nosocomial infections depend on the type of construction activity, as well as population and geographic risk groups. The lowest risk group includes offices, unoccupied wards and public areas. Examples of the highest risk groups are intensive care units, operation rooms, dialysis units and sterile processing rooms. Measures before, during, and after construction, may include personnel training, moving of immunosuppressed patients, methods for dust containment and removal, use of HEPA filters and routine surveillance for the dominant etiological agents. In situations where environmental testing for opportunistic pathogens is performed, it is important to establish a baseline, monitor during the construction process, and test after the construction is completed. Depending on the organism and sensitivity of the test, the results before and after construction may not be negative but within acceptable levels. Read more about monitoring for Legionella bacteria and sampling strategies. For the surveillance of mold spores, high volume air culture sampling similar to recommendations for USP <797> may be useful, or air monitoring by quantitative PCR testing (Aspergillus nosocomial panel). 1. Construction-related Nosocomial Infections in Patients in Health Care Facilities, Canada Communicable Disease Report, July 2001, Volume 2752, ISSN 1188-4169. 3. Gangneux, Jean-Pierre, Florence Robert-Gangneux, Guirec Gicquel, Jean-Jacques Tanquerel, Sylviane Chevrier, Magali Poisson, Martine Aupée, Claude Guiguen. 2006. Bacterial and fungal counts in hospital air: comparative yields for 4 sieve impactor air samplers with 2 culture media. Infection Control and Hospital Epidemiology. The University of Chicago Press on behalf of The Society for Healthcare Epidemiology of America. 27(12):1405-1408.